“Making the invisible visible” is pre-eminent in Angelika Schori’s artistic practice. She expands our thoughts on painting by liberating it from its historic structure of frames, canvas, and even its surface, into the space itself. By introducing primary elements such as light and color predominantly by way of an immaterial reflection, the works take on a generative presence that extends into, and becomes part of, the environment in which they reside. They become more than indivisible objects, but active phenomena of color, shape and light. By breaking up surfaces and overlaying elements, Schori challenges our expectations, invites us to watch the shimmering effects unfold. Her works function predominantly through their subtle reflections, and it becomes more than an image, more than an indivisible object; instead it becomes part of the room itself. Six to seven – six sides to a Hexagon and seven parts to a Tangram puzzle. 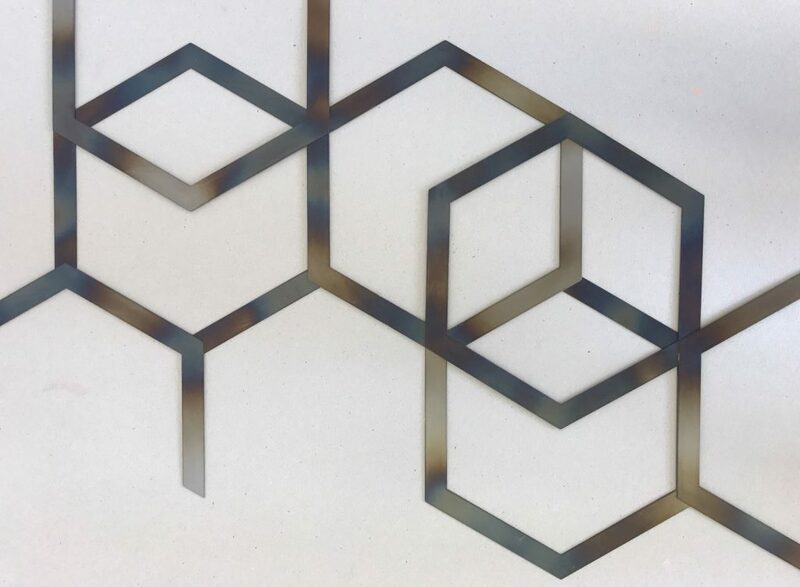 While the Tangram is philosophical and stands for holistic approach to understanding the world, the Hexagon makes the invisible visible on a molecular level. The Tangram-based work echoes the endless possibilities of this ancient Chinese game. In the Tang Dynasty (618 to 907n.Chr. ), it was believed that earth and cosmos existed in the shape of a square. A legend tells the story that a monk once gave his pupil a square ceramic tile on which to paint the essence and the manifold beauty of the world. While traveling, the plaque fell to the ground and broke into seven parts. There were triangles, squares and parallelograms. Now, the pupil could no longer assemble the perfect square. Instead he produced endless shapes, patterns and figures never to reach previous perfection. In the end, the young man understood that he would no longer have to travel the world to search for beauty; instead, he discovered that the world’s beauty lies in this broken plaque. Schori is fascinated by the conceptual complexity of the game and the dichotomy between the simplicity of the shapes and their challenges of the puzzle. She translates the legend into the space. In the exhibition, a large scale Tangram covers parts of the floor in the gallery. It is made of stainless steel and treated with heat to create a play of colors and shapes on the surface. The audience is invited to play, yet without touching or moving anything. Echoing the installation on the floor, various Tangram shapes and contours flank the walls. The use of heat on metal and the quiet and discrete reflection of color on the wall, firmly ground Schori’s new work in her aesthetic premise: making the invisible visible, removing the painter from the painting process; challenging the audience and the exhibition space to visualize the potential of a minimalist intervention into painting. Working with heat on metal is a new and fascinating process for Schori. One of the most magical things about metals in general is their ability to transmit a wide range of colors under different conditions. They yield a stunning range of colors, particularly in response to heating. As she trains the concentrated flame of the torch onto the steel, it gradually turns from a straw color, through brown into purples and beautiful indigo shades. The result is a wide color palette which brings the molecular structures to life. In addition to the Tangram work, which describes the world in the broad and general sense, Schori is also looking into the tiniest of all formations, molecules and atoms. Molecules are, in a broad sense, two- or multi-atomic particles, which are held together by chemical bonds. What is not visible with the naked eye is made visual by a complex abstract and formal “sign” language, whose basic shape is the Hexagon. This “sign” language makes substances (liquids, solids, gases) or reactions visible in and outside our bodies, for example hormones such as dopamine, liquids such as red wine, chocolate and coffee, or drugs such as Ecstasy and LSD. Each substance is defined by a different combination of whole or broken Hexagons. Schori breaks those combinations apart and reassembles them. Beginning with specific chemical formulas, which she systematically takes apart, Schori builds colorful, with heat manipulated sculptural structures resembling delicate, yet powerful, drawings. Make invisible visible – all of Angelika Schori’s works are painted indirectly. Working with heat on metal and spray painting on the back of art works make colors appear that would otherwise never be visible. In contact with day light, non-material painterly reflections are created. Angelika Schori (*1981, Biel) received her Bachelor of Fine Arts in 2010 from the FHNW/HGK (School of Fine Arts) in Basel Switzerland. She completed her MFA in 2014 with Prof. Renée Levi and Katrin Freisager. Schori has exhibited extensively in Switzerland, Germany, France and the United States in both group and solo shows. She lives and works in Basel, Switzerland.